More recently, Space Satellite was covered by Juho-Kustaa Kuorikoski on his blog in connection to his book on the history of Finnish games. His comment about the game's instructions being more impressive (and psychedelic) than the game itself isn't too far off, as it really is massively wholesome for a game of this age and style - it contains somewhere around 700 words. The unfortunate fact is, Space Satellite was made unnecessarily complex by making idiotic rules that, for example, render learning the controls impossible. More on that later on, but to make a quick description of Space Satellite, I'd say it's an unintentional parody of space gaming sub-genres of a more arcade-like persuasion. Each of the game's three action segments are different, and sort of similarly to Cosmic Tunnels, the second segment acts as a transition between the other two segments - both ways. In all honesty, Space Satellite is a pretty bad game. And I don't mean that in a good way, even though some bad games have their uses. But it does have its place in the history of Finnish games, if only as a marketing ploy to get people buying more Spectravideo computers. As for its current status, I can't really say more than I've already said. Searching the MSX forums for information about the game gives a good idea about its below averageness, unlike that one voter at Generation-MSX, who gave the game full five stars. Because Space Satellite is such an awkward game to play, many of the descriptions have to be accompanied by pictures. Therefore, for the first (and probably the only) time ever, I shall be dealing with both gameplay and graphics in the same section. While it's certainly awkward, playing Space Satellite isn't as complex as the game's documentation would have you believe. You can use a joystick for steering, but cursor keys are more recommended, because the game uses keyboard heavily otherwise. First off, once the game has loaded in, you are adviced to turn on CAPS LOCK, because all the game's commands are only acknowledged, when they are written as capitals. You exit the title screen by pressing either 0 (zero) or 1, which chooses the joystick in either control port. If you choose control port 0, the cursor keys will also be functional, and the optional fire button will be assigned to Space bar. Be advised, though: once you have chosen your controller, you cannot get back to the title screen. 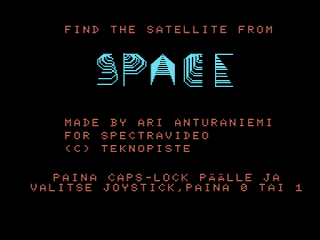 What's curious about the title screen, is that the correct title isn't even mentioned in its official form - just implied in the text: "Find the satellite from SPACE". 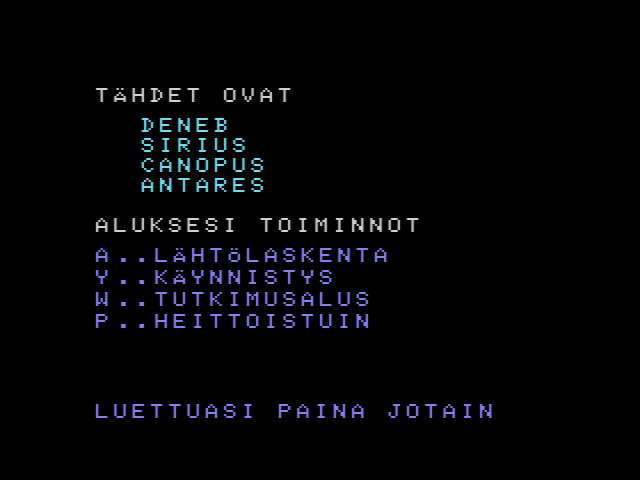 Even more curious about the entire game is, that some things have been written in Finnish, and some in English, as if the creator couldn't decide which language to settle on. A translation for the Finnish text at the bottom of the title screen I already described, but literally, it's more or less: "Turn on CAPS-LOCK and choose a joystick, press 0 or 1." Randomly given destination stars and operating keys. The first thing you would need to do is to memorize the names of four given stars, and four keys from the keyboard, which you will need throughout the game. These change after every Game Over. Happily, there are only about 12 stars included in the circulating list, which is easy enough to memorize completely. However, the four keys can be anything from A to Z, and each has their own purpose: starting the countdown (Lähtölaskenta), take-off (Käynnistys), launching an exploration vehicle (Tutkimusalus) and activating the ejection seat (Heittoistuin). My suggestion is, write down a list of all the stars so you can more easily check them whenever needed, and make some sort of a grid on paper for the four different action buttons, and write them down into a new column for each new game, so you don't have to remember them if such a thing doesn't come too naturally for you. Once you think you've memorized enough, press any key and you will be taken to the first level, which is something of a Jupiter Lander clone with weird controls and an enemy to avoid. But for starters, you need to type in one of the destination stars from the given list of four (Mikä kiintotähti?). If you made a typo, you will be given an error notice, and you will have to try again. Six errors within the same level will result in a Game Over. Next, you need to start the countdown after the two lines of text have come and gone (Aloita lähtölaskenta / Initiate the countdown; Lähde punaisella / Launch on red). Your purple spaceship is standing on the red platform, which will start blinking blue and cyan, once you have initiated the countdown by pressing the given button, and at some random point, the platform turns red again, whereupon you must immediately take off by pressing the given button and then hitting the fire button (or Space bar) and keeping it down until you have lifted off. If you are too early or too late, it counts as another error. Once you are airborne, you have to get yourself to the left platform to refuel your space ship, while avoiding a randomly acting hostile blue UFO. Another thing you need to worry about is not to overheat the space ship, the limit of which is indicated by sound and the ship turning red. 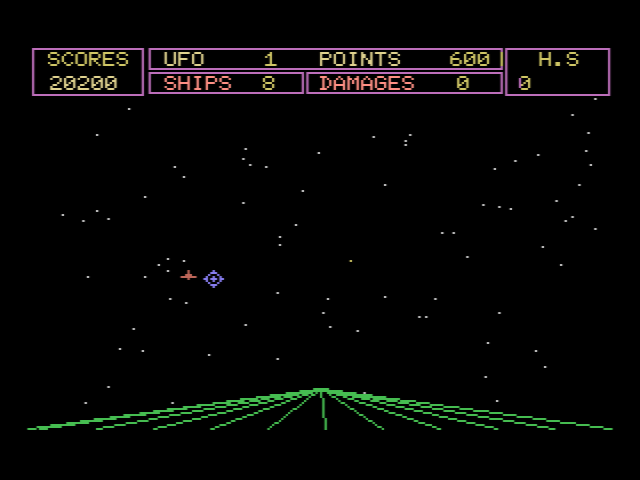 Once you have carefully landed there and refilled, the HIGH SCORE window at the top right corner lights up, and that area of the screen is where you must now fly to. For the first level, you are given no weapons, and any collision which makes you crash results in a Game Over, but you can use the ejection seat to try and save yourself for another attempt, in which case you wouldn't need to memorize new keyboard controls. If you are lucky enough to reach level 2, this is where you get to use a weapon, and that's all the level is about, really. It's a first-person space shooter of sorts. A bunch of alien ships will fly in from random directions, some of which will shoot lasers at you. You need to take down ten of them with your controllable homing missiles, before you can enter the third level. You can only withstand six hits before your ship is too damaged to continue, but happily, this level is much more lenient than the first one. 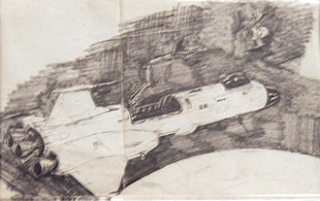 The third level starts off with your ship descending on top of a tunnel system on your chosen star. Here, your mission is to get into the tunnels with the provided exploration vehicles, pick up the round blue items (one of which is a stolen satellite) and avoid getting hit by the round yellow rolling thing. Once you have found the necessary item, you must return the exploration vehicle to your ship via the newly formed passage. Then it's just back through level 2 to level 1, land your ship and see if the satellite was yours. If not, you need to start over again with one of the other stars left unexplored from the list of four you were given to start with. And so it goes until you find the correct satellite and bring it home. As I said, the gameplay is awkward at best, and infuriating at worst, and the first level is really the worst due to its slowness and unfairness of the hostile UFO's speed compared to your own. Otherwise, it wouldn't be half as bad as it is. Even the randomly chosen key controls can be considered a refreshing unique thing, although definitely unnecessary. The graphics aren't too bad, actually, at least in the 2D parts. I could certainly call them mediocre, which can be considered a light praise in the light of all the other aspects in the review. The second level's style suffers from the lack of proper 3D graphics, but it works well enough for the game. If the graphics or gameplay mechanics of Space Satellite didn't impress you, the quality and quantity of sounds will not surprise you in the least. For one, there is no proper music, and the only thing you hear in the title screen is a high-pitched note fading in and out. The only bit of sound that can be considered as sort of music is the loop of eight quickly played same notes from different octaves plus a small pause, once you press the elusive Any Key in the memorizing screen. Most of the in-game sound effects are just a few different types of "bonnnnggg" sounds, quick "bip" sounds for the countdown and regular explosion noises. 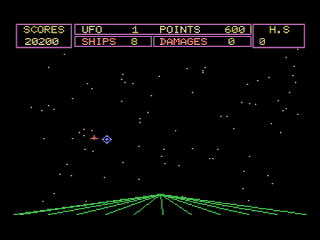 There are a few sound effects that give the game some actual personality, though: using the space ship's thrusters will make an ascending long beep mixed with white noise, and then there's the low droning noise of the enemies, and the weird distorted beeps for each key press when you type in the name of the chosen destination star. All in all, the sounds in Space Satellite are kind of cheap in the Cascade 50 sort of way, but have enough of personality to make it feel like this is almost a proper game. Not quite mediocre, but just about acceptable. It is difficult to say words of praise, when there is so little praiseworthy. Space Satellite is not the worst game ever, and structurally, it's even a rather interesting game, but it has been made unnecessarily difficult to play by making the first level so unplayable. It has diversity and personality, characteristics that are always welcome, but its just too basic to work properly. As it is, though, it would have easily made it into the Unique Games! 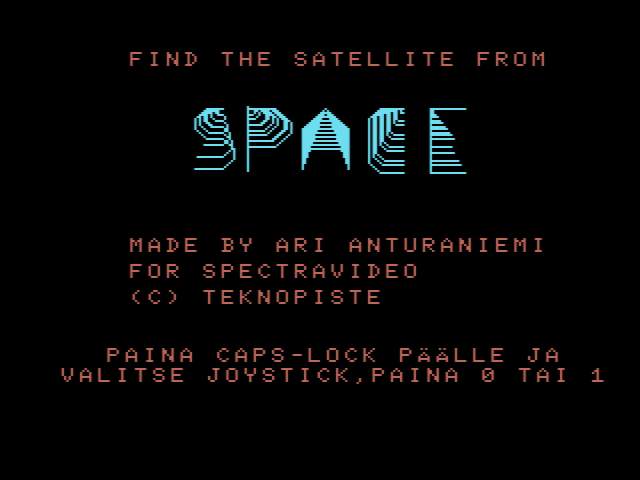 series, had it not been made in Finland, and while it bears some questionable honour, Space Satellite still has its firm place in the history of Finnish games. If you want to have a go with this awkward little beast, it can be found from the CBM8bit cloud. The easy way to find it is to go to this thread at MSX Resource Center and download the linked zip file from the original post in the thread. Your best bet at getting the game to load up, is to download the latest version of openMSX, somehow acquire the required .rom files for SVI-728 and load the game from either one of the cassette image files included in the zip file. Above, I have told you everything you need to know about how to play the game, so the only thing you need to have in addition to all this is perseverance. I can't say it's worth the trouble, but if you're like me and wish to know everything there is to know about Finnish retrogames, you can't miss this one. Thanks for reading, hope it was helpful! Next time, back to normal comparisons, but until then, kiitos ja näkemiin!